We all know it's good practice - and frankly, just plain good hygiene - to give your makeup brushes a good scrub every once in a while. Foundation brushes, blush brushes - you name a brush, and you know you gotta wash it. But have you ever thought about cleaning your spoolie brush - you know, the little one you use on your eyebrows? Well, once you've seen what happened to Katie Wright. We all know the urge to squeeze a spot can prove all too much sometimes - I mean come on, let's just admit right here, right now that we're all pretty much addicted to those Dr Pimple Popper videos. We know we shouldn't do it - all that bacteria spreading across our faces? No thank you. But once you see what happened to Katie Wright, you'll really be put off spot squeezing for life. "A week ago I decided to pick at what I thought was a giant under skin pimple because it had been hurting for a while and got too painful to ignore," Katie said on Twitter about her ordeal. "Within an hour my face had swelled up and it HURT." Turns out that what Katie had wasn't just a run-of-the-mill spot, but a staph infection, which mostly starts out as a minor skin infection but can develop into a a more serious infection of the blood or major organs. "I went to the emergency room and they said it was a very serious case of cellulitis, which is a version of a staph infection... it effects (sic) the deep cellular tissues with no main source to attack. Since it was on my face, there was a huge risk of it spreading to my brain or my eyes causing me to go blind. "I wanted to share this because this most likely happened from bacteria getting on my eyebrow brush. I'm super strict with washing my face/beauty blender/brushes, but I never thought to disinfect my eyebrow spooly." Katie wants to make sure people learn from her mistakes and clean all their makeup tools effectively to avoid what she has gone through: "If you wear makeup PLEASE make sure it's a step in your cleaning routine!!!! It's a small thing to do to avoid a painful, expensive and traumatising thing on your face." 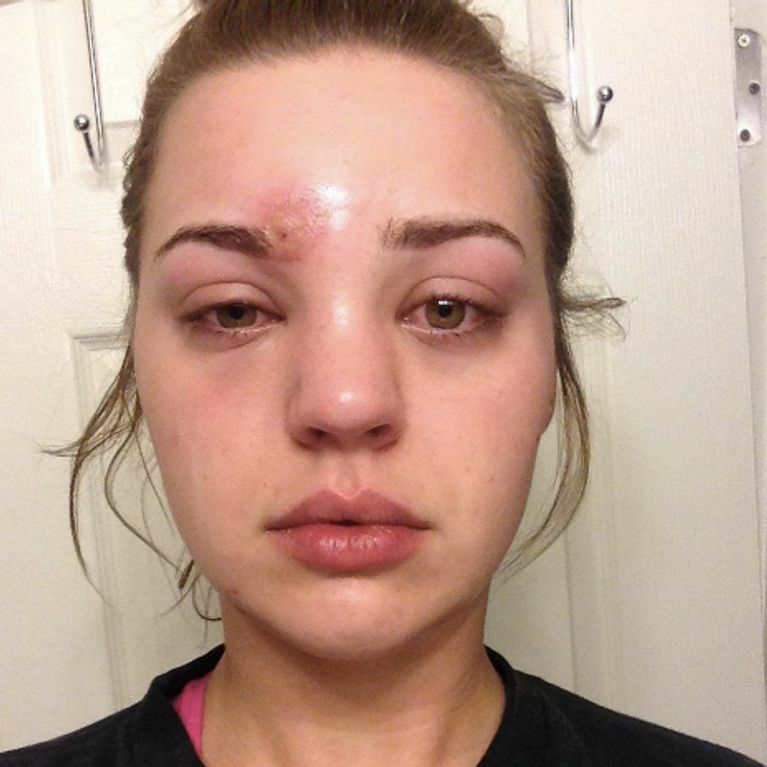 The photographs that Katie included showed a dramatic swelling in her face over the course of 48 hours - and it's not all that uncommon, as one commenter proved when she included a picture of her sister, who got the same infection. Now if that doesn't make you want to clean your brushes right now, then we don't know what will.